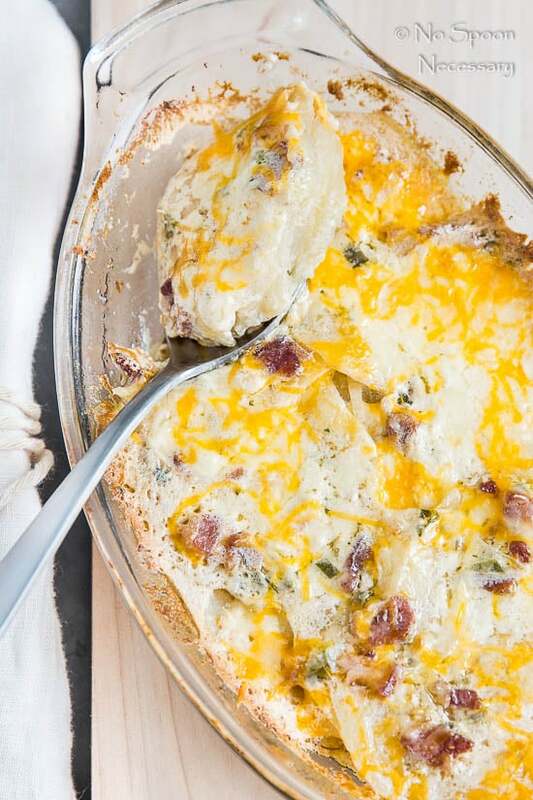 Creamy Jalapeño & Bacon Potatoes au Gratin inspired by Fleming’s Steakhouse. 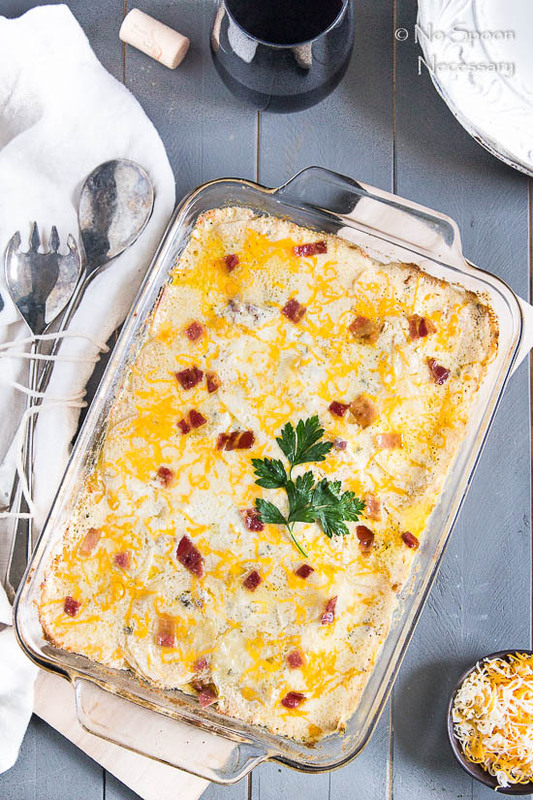 Layers of soft, thinly sliced potatoes with bacon, jalapeños and two types of cheese! 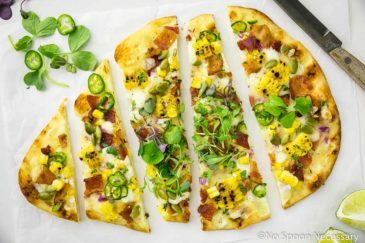 This side is sure to be a crowd pleaser! Hello, friends! How was your weekend? If you follow this blog you know I went back to Florida for my grandmother’s funeral. It was a beautiful service, but I am emotionally very drained. Have you guys been to Fleming’s? My mother, Mod, Boy and I used to go once a month to their wine and food pairings. It was always a lot of fun, the food was fabulous and the wine definitely flowed. 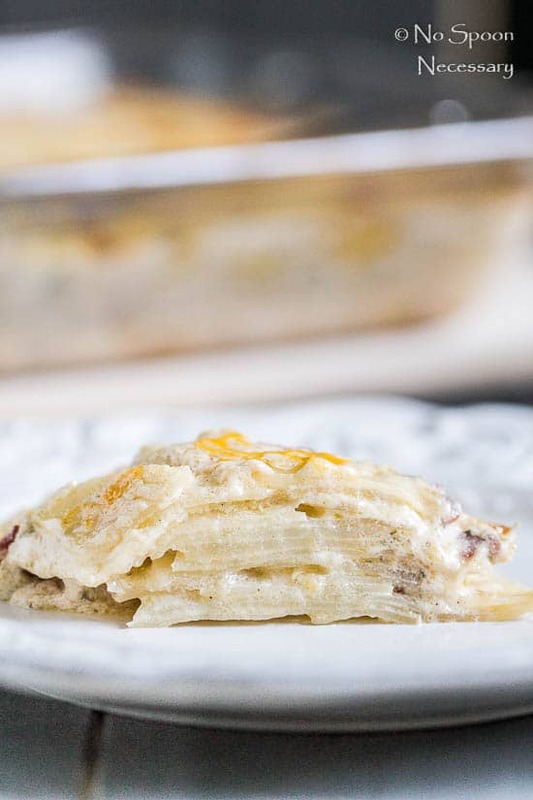 I have also eaten there numerous times just for dinner, and in case you aren’t familiar with the restaurant, their jalapeno potatoes au gratin are bomb-diggity. 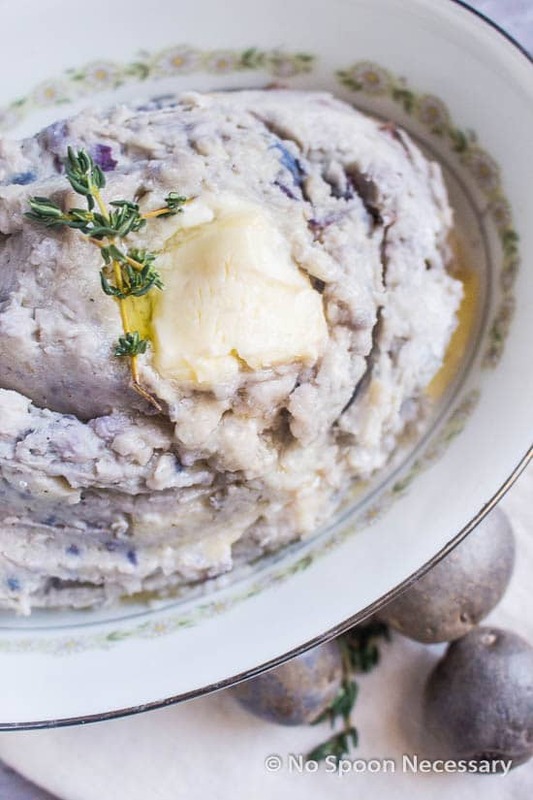 Like, I could order just (4 to 10 sides of) the potatoes for dinner and be beyond content. 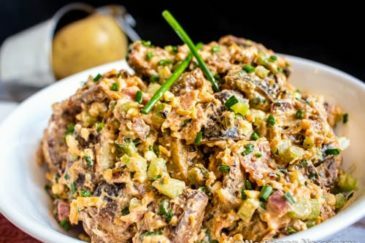 A few months ago I was reminiscing about the good ole days and Fleming’s, so I decided to make a NSN version of their divine potatoes. Mine are pretty darn close to the original, except I used Colby and pepper jack cheese instead of cheddar and Monterey jack. These potatoes au gratin are silky, creamy, cheesy, bacon-y, a hint spicy, smoky and the perfect amount of salty. They are seriously decadent and the ultimate in the comfort food department. 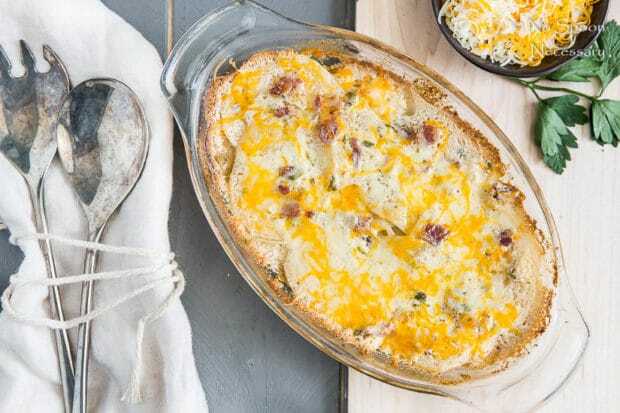 These Fleming’s inspired Jalapeno & Bacon Potatoes Au Gratin need to happen in your house. Just trust me on that, because I’d never steer you wrong. 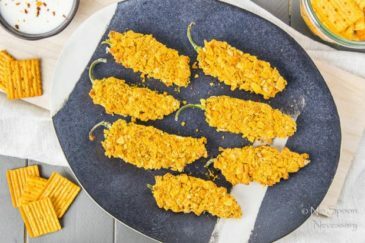 So make these next time you need a scrumptious side, or add ‘em to your Christmas or New Year’s spread. Promise everyone will love them! 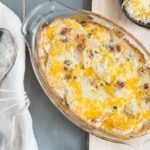 Creamy potatoes au gratin layered with bacon, jalapenos and two types of cheese! 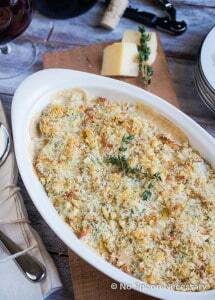 Inspired by Fleming's Steakhouse potatoes au gratin. Preheat oven to 350 degrees F. Spray a 9x13’’ baking pan with olive oil and set aside. Add bacon to a medium sauce pan or Dutch oven and place over medium heat. Cook until bacon is crispy and cooked through, about 11-15 minutes. Use a slotted spoon to remove bacon to a paper towel lined plate and set aside. Pour off all but 2 tablespoons of bacon grease*(if necessary) and add the jalapenos, leeks, salt and pepper. Increase heat to medium high and sauté, stirring occasionally, until leeks have softened, about 4 minutes. Add garlic and cook until fragrant, about 1 minute. Add in the heavy cream and half-and-half. Bring to a simmer and immediately remove from heat. Add in both cheese (1 cup each) and stir until cheese is completely melted. Stir in bacon and parsley. 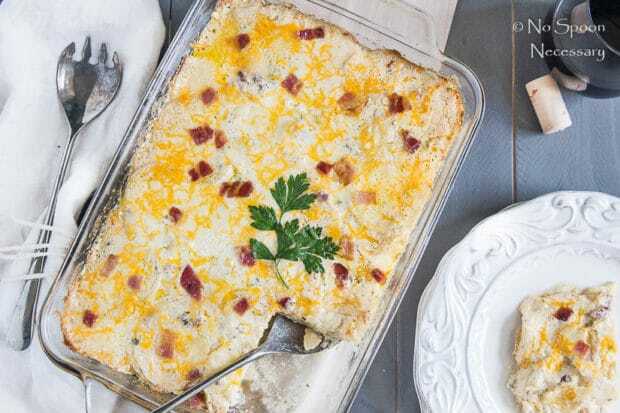 Using a large spoon, add just enough of the cheese sauce to the greased pan to barely cover the bottom. Add the potatoes to the pot with the remaining cheese sauce and gently toss to thoroughly coat. Use a slotted spoon to transfer the potatoes to the greased pan (using a slotted spoon will keep some of the cheese sauce in the pot). Top the potatoes with the remaining cheese sauce in the pot. Cover the baking dish with aluminum foil and bake for 1 hour. Remove from oven and sprinkle with additional cheese (if using). Bake uncovered for 10 minutes. Use a small fork or toothpick to test potatoes for doneness. 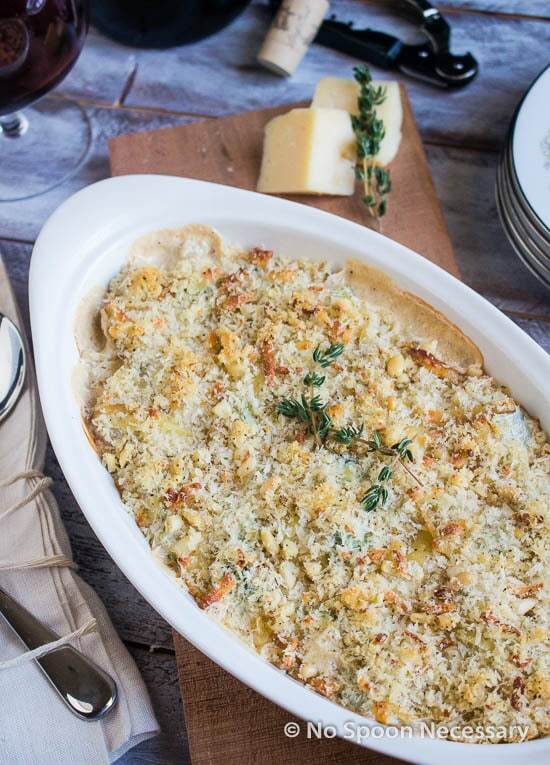 Switch oven to broil and cook until top is golden brown, about 1-2 minutes depending on the strength of your broiler. For medium - spicy potatoes completely seed one jalapeno and leave the seeds intact in the other. 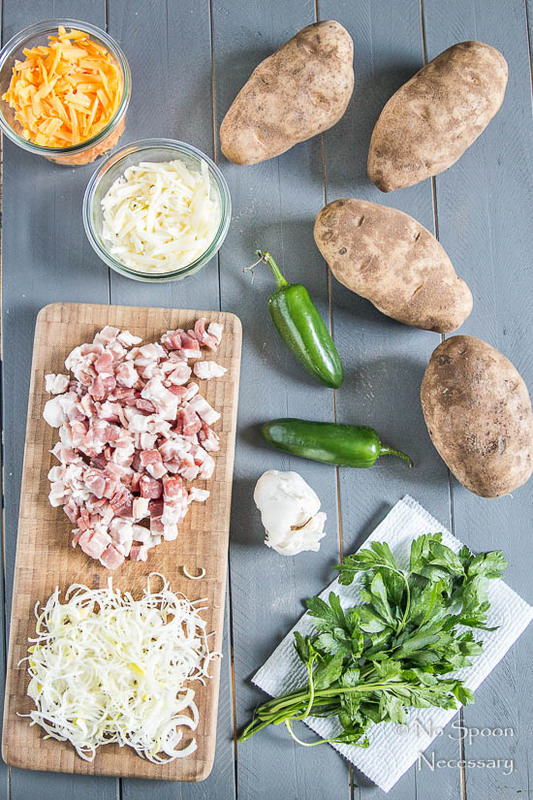 For mild - spicy potatoes – completely seed both jalapenos. 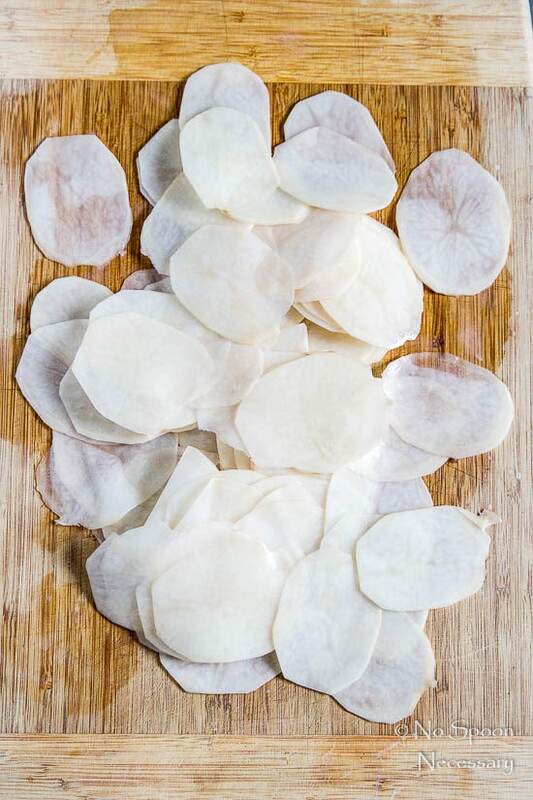 *Cheeses- shred an additional ¼ Cup of each cheese for topping potatoes. 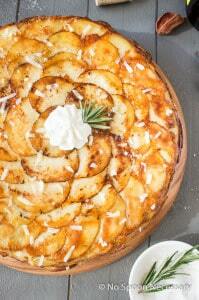 Sprinkle the cheese evenly over potatoes after you remove the aluminum foil, then continue to bake as directed. *Bacon Grease – don’t simply discard bacon grease, pour it into a small container with a tight fitting lid and store it in your refrigerator. 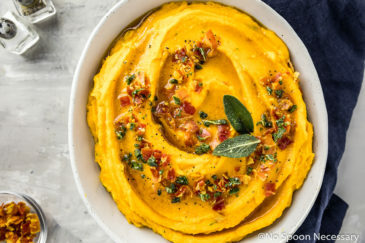 Use it in place of butter or oil to add bacon flavor to dishes. *To Make in Advance – Cook according to directions, covered, for one hour (do not sprinkle with extra cheese if using). Allow to cool on counter for 20 minutes. Covered the dish and transfer it to the refridgerator. When ready to serve, remove from fridge and set on counter for 30 minutes to remove chill. Preheat oven to 350 degrees F. Bake, covered for 20-25 minutes. Remove foil and continue baking as directed. 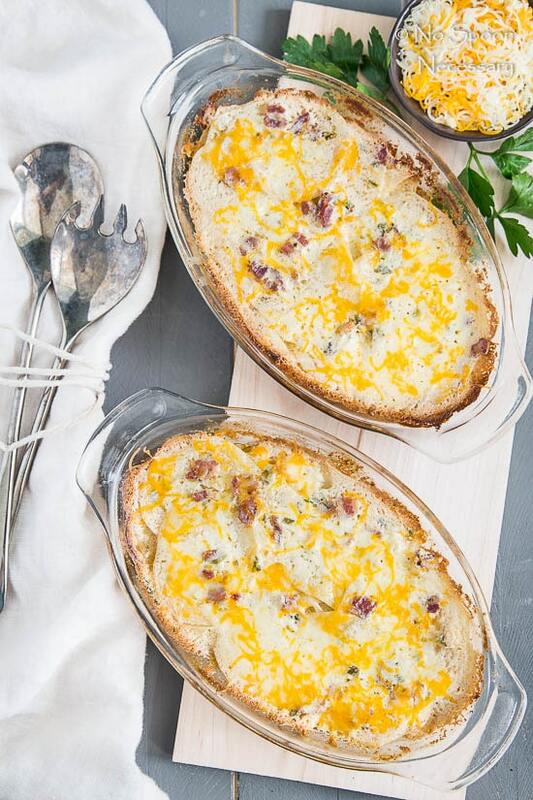 *You can also make the potatoes in individual baking dishes. Bake according to the same directions above. 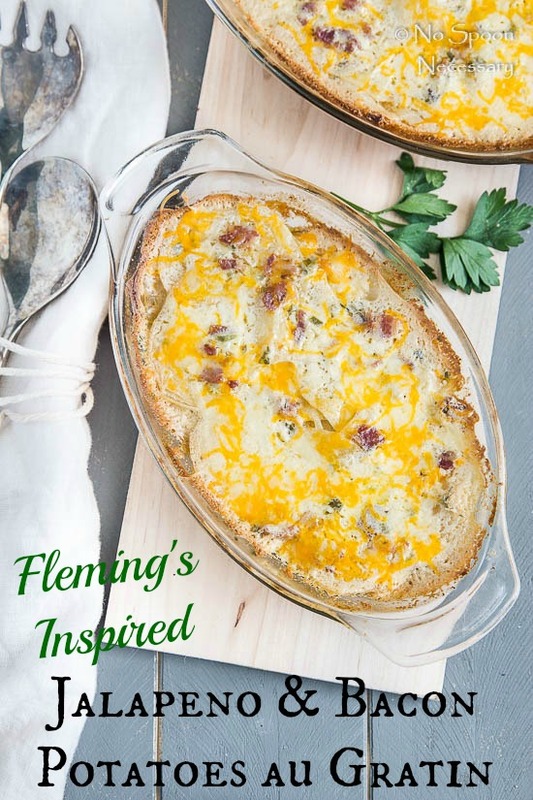 *Recipe adapted from Flemings Site, but they recently removed their recipe from website. Excellent recipe, turned out delicious, thanks for writing this post! I especially appreciated the tips about jalapenos and spice level. Will be perusing more of your recipes soon! There is nothing that this PA Dutch girl loves better than potatoes! Especially if we are adding cheese! Making these this weekend!